My daughter has been complaining of being tired the past few days. I had assumed it was because she had been very active at her Nana’s last week. However, yesterday, she ended up with a fever of almost 103. She had never had a fever that high. I freaked out a little bit, and my husband kept assuring me that we did not need to go to the ER just yet. She is better today. She still feels sore. I think I am getting a touch of whatever she had. However, it was a reminder of how I am still not quite my old self yet. Ever since the first miscarriage, I have been a little on edge when it comes to the kids….their safety, germs, getting sick…etc… It’s not like I set to do be that way intentionally, and mentally, I am quite all right. However, that fierce protective mama bear instinct is always there. I haven’t taken time for myself most of the summer, and most of that has been my own doing. Granted, by the time I got that time last week, I think we were all sick of each other. Last winter, after the first loss, I started out as the Queen of Hand Sanitizer to the point the kids revolted. My hands were raw from constant cleaning. I slowly cut back as I slowly got back to myself, but I must admit, it was a bit much. I am sure that with the current problem with the neighbor’s dog, I have been a bit overprotective in that I am always right at the door if the kids go outside, and he is out there. He is rather large, and he barks and growls at all of us even though he has to know at this point, we live here. I just don’t want the kids to be afraid. I know I over-reacted last night when it came to Sissy Girl. It’s just she had never had a fever like that. Quite honestly, she usually ends up just getting the stomach flu, and we have turned stomach flu protocol into an art form in this house, complete with a list of movies reserved for that purpose. I sat and cuddled her for the longest time. I didn’t even want to go to bed last night when my husband gave me the option to sleep while he stayed up with her. My point for all of this is that mamas worry. We want to protect our children. When you experience a loss, sometimes that heightens that need. My kids and family have been pretty patient with me. I know they are pretty tough cookies. Someday, I will relax a bit. It will be okay. 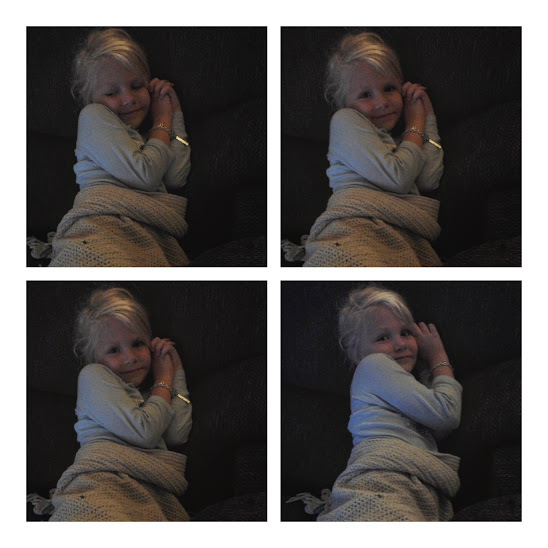 Even sick, she still poses!